Thousands pack the streets for the Women's March on Washington rally outside the National Museum of the American Indian in Washington, D.C., on Saturday, Jan. 21. We are in the middle of a violent upheaval in our political and social systems, and fascism is taking hold, so it may seem counterintuitive to pause and take time to look at the root causes of our current reality. As we join together in the resistance, we must stand shoulder to shoulder with each other. For true solidarity, however, we need to do more than get rid of Donald Trump, we need lasting change. 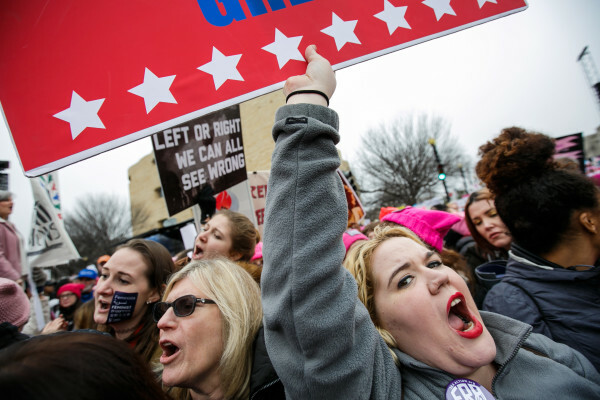 When thousands of people marched on Washington, in Portland and Augusta, and around the world at the “Women’s March” in January, it was a vibrant and empowering time. The presidential election shocked so many of us who were suddenly looking around and wondering, how did it get this bad? We knew we had to do something. On Facebook, a friend shared an excellent piece by a woman of color about why she was not attending the march. I read it because it’s my responsibility as a white woman to listen to black and brown voices. The author’s statement that “calls for ‘unity’ at this march may again silence the most vulnerable women” resonated as a deep and painful truth. The piece shared constructive criticism from which we white readers could learn; it also offered concrete suggestions for solutions. Another white woman commented on Facebook that she found the piece problematic. She essentially replied, “not all white women.” She defended herself as if she had been personally criticized. She said the article’s message “pick[ed] at more ways to divide.” She wanted “unity.” She seemed to think that a woman of color saying the way things are isn’t working for her was divisive. The question I want my fellow white progressives to ask themselves is, why did we not show up by the thousands in protest before the Women’s March? I’m not suggesting the recent marches were harmful. They were powerful and important, and I’m glad they happened. Public demonstrations are an essential component of effective resistance. But, I hope my fellow white people might join me in asking ourselves, why did we not do it before? Systemic racism has kept black and brown people down since our country was founded. From mass incarceration to the absence of real opportunities in employment, housing and education, our racist institutions have been harming and killing our black and brown neighbors since day one. Or, setting aside the fact that our systems only function now when black and brown people are kept down and out, let’s look at some current events: why did we not march on Washington after Eric Garner’s well-publicized murder? Or Sandra Bland’s? The list of black and brown people killed by police could, of course, go on. Why did we not get active by the thousands long before Trump was elected? On Sunday, I heard a white man describing the Barack Obama years as a time of progress and peace. That simply wasn’t the case for black and brown people. But, despite the obscene reality of mass incarceration, correctional control, police brutality, and many other consequences of systemic racism, we white people didn’t march. We didn’t demand the system change. The truth necessarily lies in a “less than” value we place on the lives of black and brown people. It’s ugly and uncomfortable. It’s everything we don’t want to be. It’s what those racists with the Confederate flag flying are, it’s not who we are. Right? Until we face the truth that we have mostly ignored institutional racism because we valued black and brown lives less than white lives, we we will never get beyond our feelings. Our psychological anxieties, the need for denial, our guilt, and our shame will make us seek neutrality and require “unity” rather than working for justice and solidarity. Until we get honest, we will continue being the problem. Heather​ ​Denkmire​ ​is​ ​a​ ​writer​ ​and​ ​artist​ ​who​ ​lives​ ​in​ ​Portland​ ​with​ ​her​ ​two​ ​young​ ​daughters.​ ​After a​ ​few​ ​challenging​ ​years,​ ​she​ ​is​ ​growing​ ​her​ ​small​ ​business,​ ​where​ ​her​ ​team​ ​helps​ ​nonprofit organizations​ ​win​ ​grants.​ ​She​ ​can​ ​be​ ​reached​ ​at​ ​​column@grantwinners.net​.​ ​Her​ ​columns appear​ ​monthly.